>> Proceed to floor 24. You walk up one flight of stairs to FLOOR 24 and reach the MANAGERIAL LOCKERS. You then proceed to find LOCKER 118 and pull out DREDLOCK'S KEY! >> Open Locker with key. You use up DREDLOCK'S LOCKER KEY and discard it from your INVENTORY. What the...DREDLOCK'S MANAGERIAL LOCKER seems to be completely empty. All of that effort for nothing? You find yourself fairly dismayed at this turn of events. >> look at door and take object taped to it. You realize that there's something taped to the bottom of DREDLOCK'S LOCKER DOOR, and grab it. 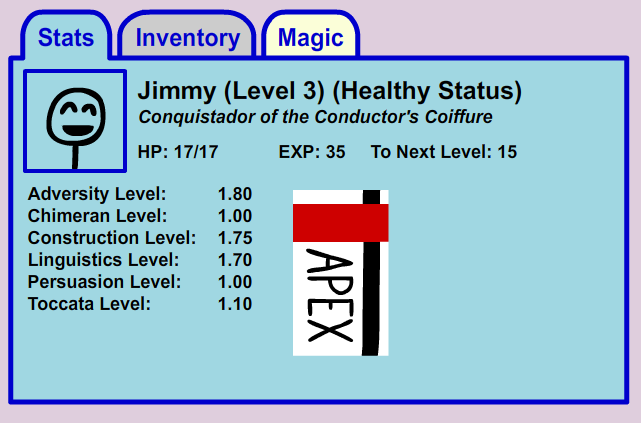 The RED KEYCARD automatically stores itself on your STATS TAB. You do this (on all except for LOCKER 112), but none of them budge. 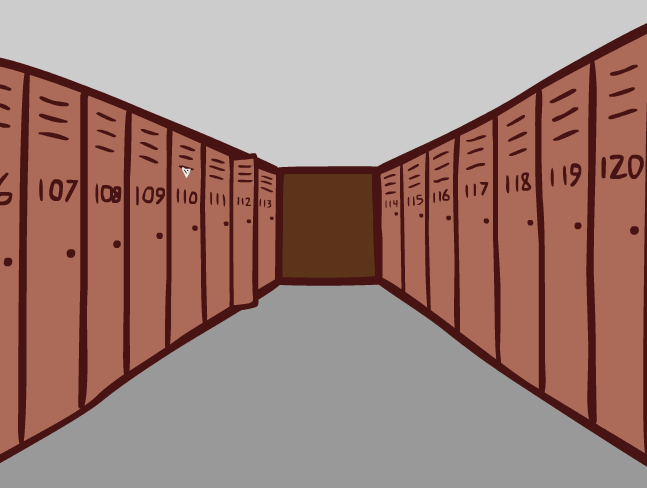 These lockers are surprisingly high-quality! Try as you might, you just can't seem to pry DREDLOCK'S LOCKER DOOR off its hinges! It looks like it's staying put. 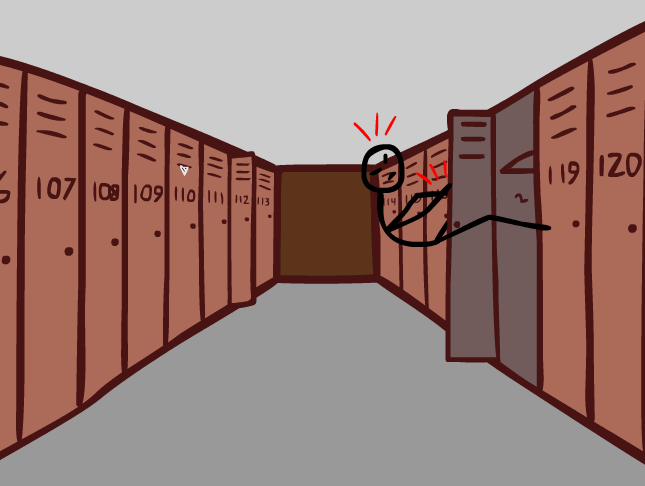 >> Hide inside locker. Your hours of playing stealth video games tell you to. You quickly jump inside the empty LOCKER and close the door behind you, waiting for someone to pass by so that you can get the jump on them. The next person to come in here is in for it! You lie in wait. Oh shoot, you're locked in! You open the LOCKER DOOR and step back out. 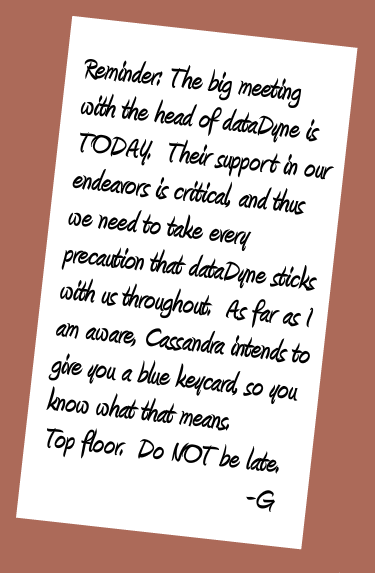 >> Read note from locker 110. You pull out the NOTE barely protruding from LOCKER 110, unfold it, and read it.